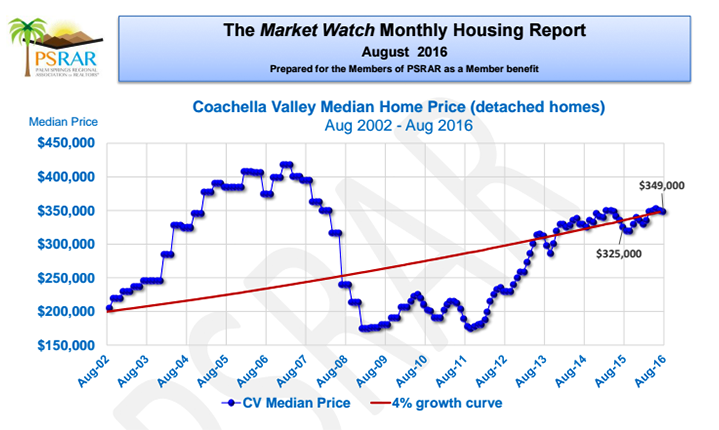 Posted on September 19, 2016 by Social NetworX Inc..
Strong indicators continue to show that the outlook for Coachella Valley real estate is promising. According to the Palm Springs Regional Association of Realtors, seven of the nine cities in the area showed year to year gains with respect to median home prices. Leading the charge is Desert Hot Springs which boasted an increase of 17.6% followed by La Quinta and Rancho Mirage, tallying 11% and 6.7% gains respectively. If we look at the market from a longitudinal perspective, it is clear that the decline in home sales which plagued the market some five plus years ago has started to fade. The average of three month sales is currently 9% above a year ago. The true barometer of the market is always the twelve month average and statistics are showing that we are currently up three units more than a year ago which demonstrates strength in the market.